The Historic Kiskatinaw Bridge is located about 30 km north of Dawson Creek, BC within Kiskatinaw Provincial Park (established 1 May 1962). 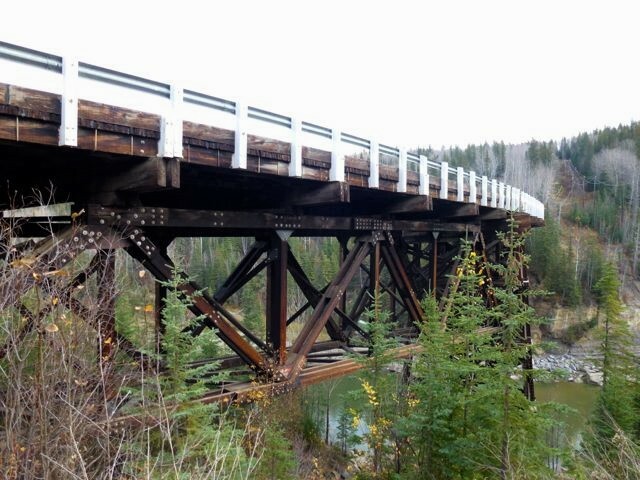 Built in 1942-43 by the US Public Roads Administration (PRA) to replace the original timber trestle, the bridge is a curved, timber-truss structure about 122 m in length. Credit: South Peace Historical Society. Resource ID: 13158. Construction of the Historic Kiskatinaw Bridge began in late 1942 by Dow Construction, a Toronto-based company under a contract with the PRA. It was one of 133 permanent bridges constructed by the PRA to replace the temporary crossings used by the US Army to build the pioneer road. 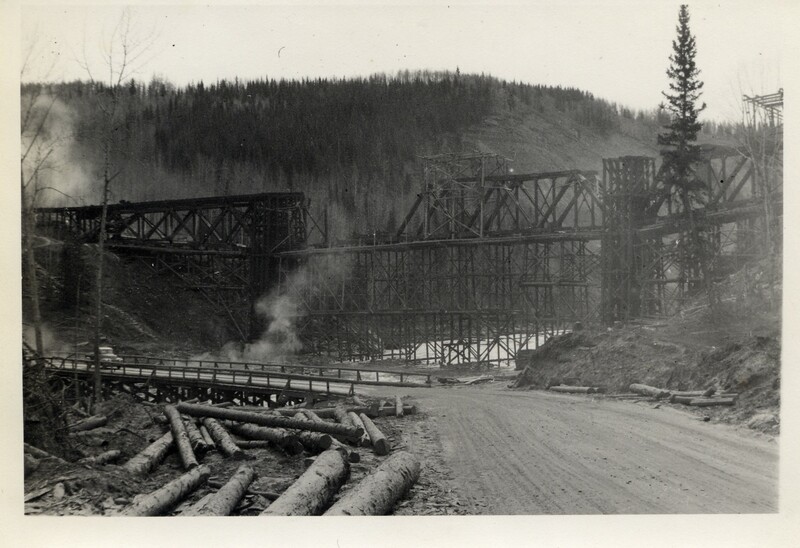 This three-span timber truss bridge has an amazing nine-degree curve – a curve that PRA engineers designed to accommodate the highway’s steep change in grade on the west end and the need to land at a notch in the cliff on the east end. At the time, it was the first wooden curved bridge to be built in Canada. Credit: South Peace Historical Society. Resource ID: 13157. In addition to the challenge of building a significant curve into a wooden bridge, the PRA had to contend with assembling masses of materials, shipping delays, floods, and unusual temperatures – all of which extended the construction time to nine months. About 500,000 board feet of creosoted British Columbia fir had to be shipped from the coast and gravel had to be hauled 16 km in from a Peace River crushing plant. An unseasonal cold snap halted the curing of the cement poured to create the bridge’s pedestals and piers, which meant the construction crew had to prevent the curing concrete from freezing. They did this by enclosing the concrete and keeping it to a temperature of 22°C (72°F) for 10 days. This was extremely difficult given that the work involved almost 610 cubic m (800 cubic yards) of concrete. 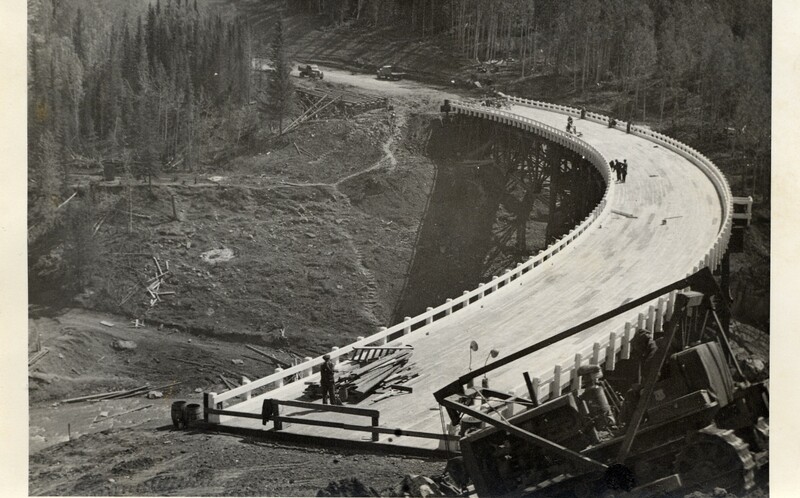 Development of the oil and gas industry in the post war years resulted in the need for a new bridge to handle wider and heavier loads; as a result, the Alaska Highway was rerouted in 1978, bypassing approximately 10 km of the old highway and the historic bridge. The Historic Kiskatinaw Bridge remains on a former alignment of the highway, and is a promoted tourist attraction due to its history, wooden deck, scenic setting, and unusual form. The Historic Kiskatinaw Bridge is included in the Peace River Regional District’s Regional Heritage Registry.